The Jem doll line was supported by not only the animated series, but by a bunch of different commercials, even several for each toy. 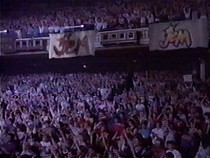 Many featured singing, with special written lyrics. As for the doll details, that was handled by a female voice or even male sometimes. 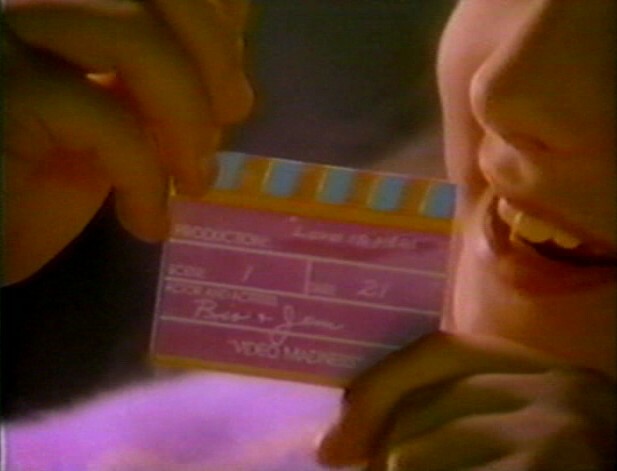 Then there were girl actors who played with the toys and demonstrated how cool they were. 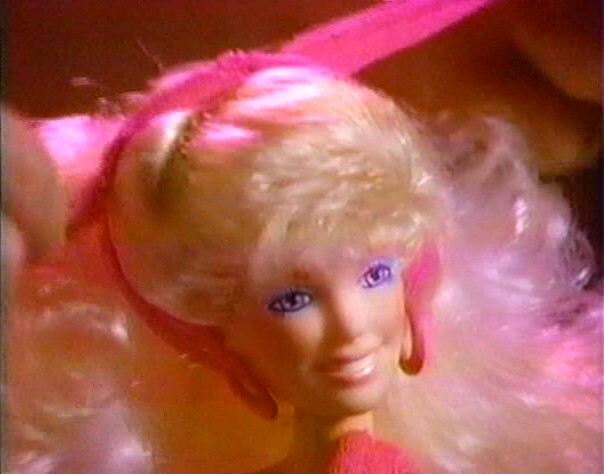 The main content in the cartoons was telling the story of Jem's secret identity, talking about the dolls' hair, showing the uses of the playsets, mentioning that most dolls included cassettes, that all items are sold separately, and that they were made by Hasbro. They used words like: truly outrageous, cool, fresh, fantastic, beautiful, glamorous, pretty, great, incredible, awesome, real, new, fine, best, ultimate, and fun. Words that all of us Jem fans can agree about when it comes to Jem! 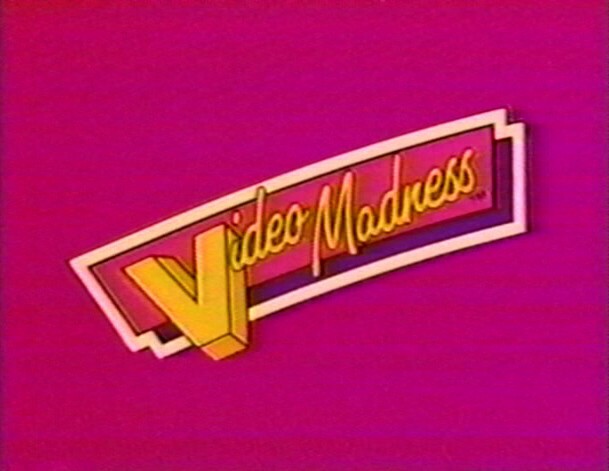 The most fun commercials were of course the ones that featured unique animation, which differed somewhat from the cartoon look. All of which were storyboarded by Will Meugniot. Some of the commercials were also available in French. Only Jem in this commercial, not even Jerrica. Here Jem has a solid pink microphone. Female voice: It's Jem, coming soon from Hasbro! 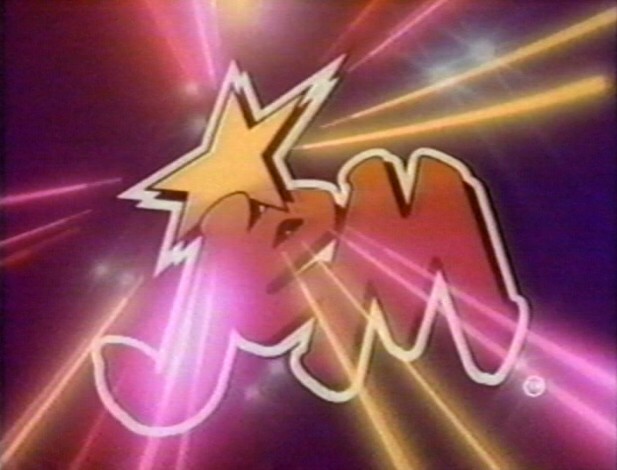 Part of Jem Theme song playing with the cartoon clip. 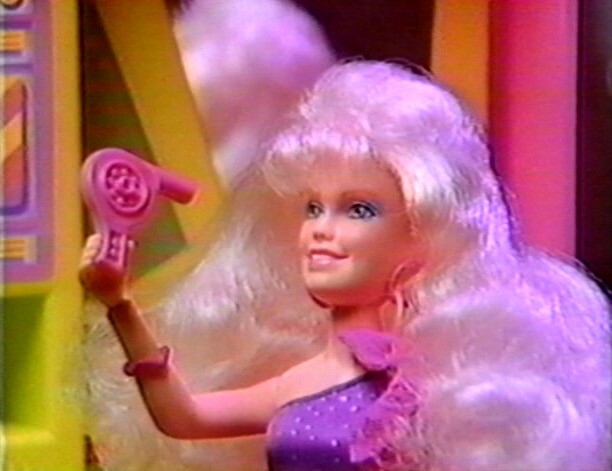 Female voice: Jem, coming soon from Hasbro! 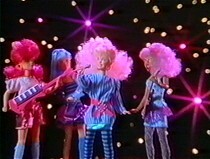 The Holograms are only referred to here as Jem's friends. Here Jem has a solid pink microphone. Featured: Jem/Jerrica, Kimber, Aja, and Shana. Female voice: She's Jem, the most glamorous rockstar ever! Girl 1: Check out Jem's clothes! Female voice: No one puts on a hotter concert. 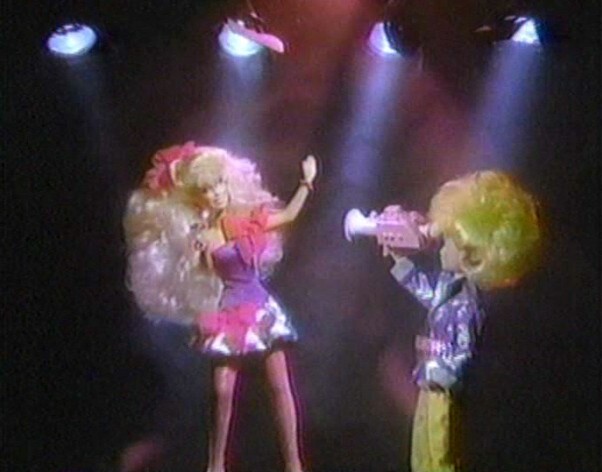 But only Jem's friends know she's also Jerrica, president of Starlight Music. Girl 2: I love her outfit. 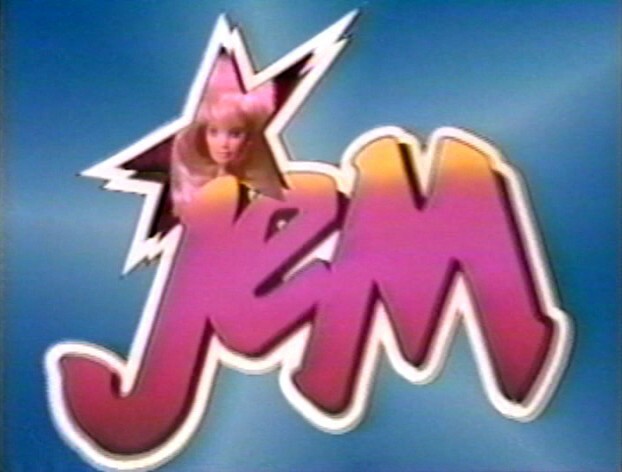 Female voice: With her Jem star earrings, Jerrica converts in a fashion flash to Jem. 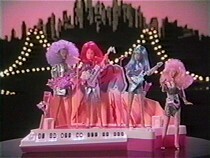 Britta Phillips and background singers: Jem is truly outrageous. 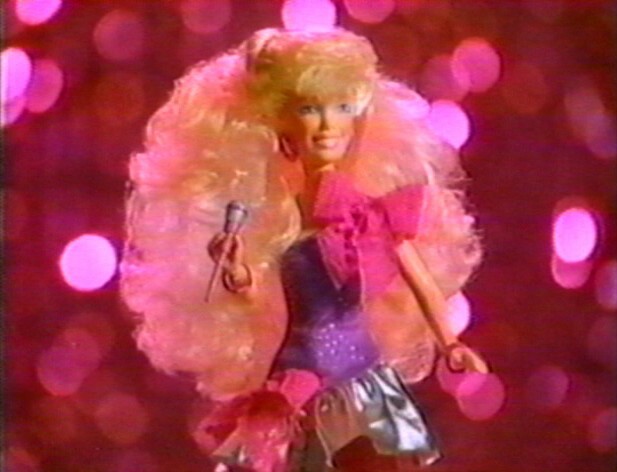 Female voice: Jem comes with microphone and Jerrica outfit, from Hasbro. Now Jem's "friends" are named "The Holograms" but are still not referred to by their first names. 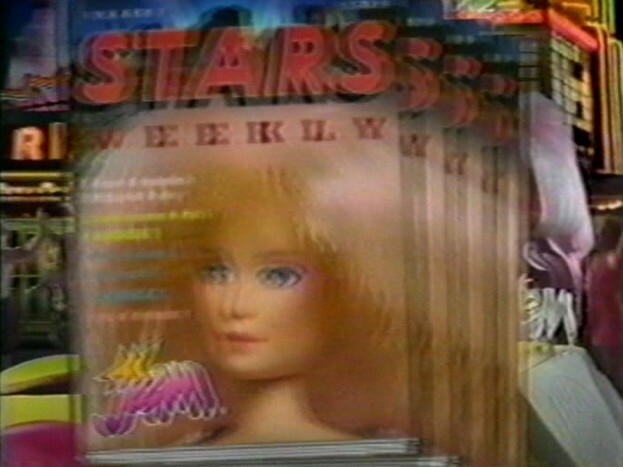 One of few commercials where we get to see the Jem doll box, and even prices. Part of Jem Theme song playing in the background. Male voice: The amazing Jem! The cool, glamorous fashion doll. But Jem has a secret only you can share. Switch on her sensational flashing earrings, and change her into an outrageous rockstar. 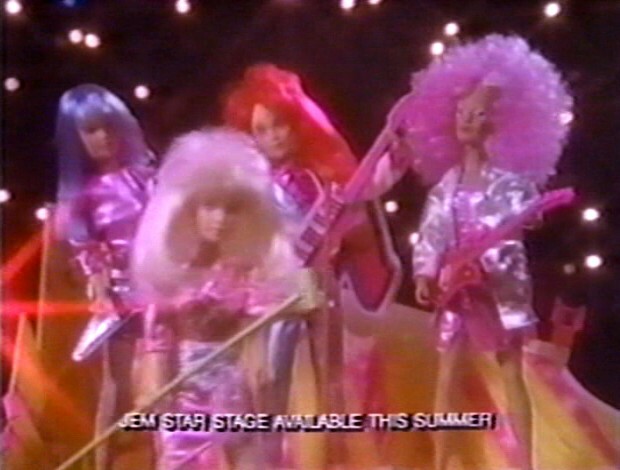 The glamorous glittering world of Jem, and her hit group, the Holograms. A whole new world of music and fashion. 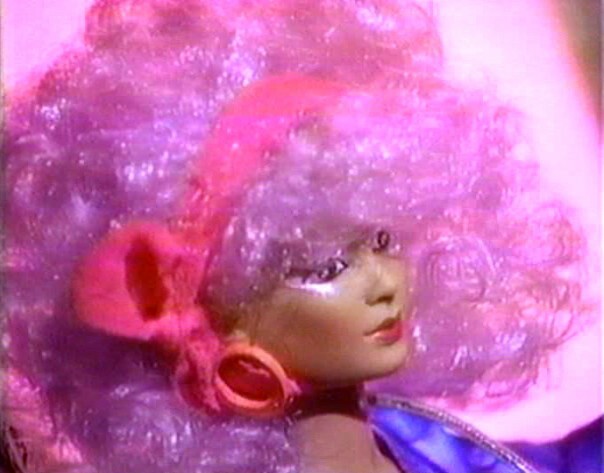 Jem, the incredible new fashion doll. 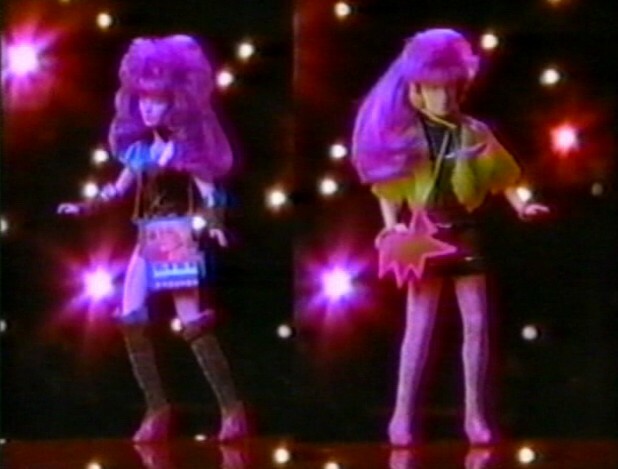 The Holograms are called both "The Holograms" aswell as Jem's "friends", but are still not mentioned by their first names. Now Rio finally makes an appearance, no mention of him though. 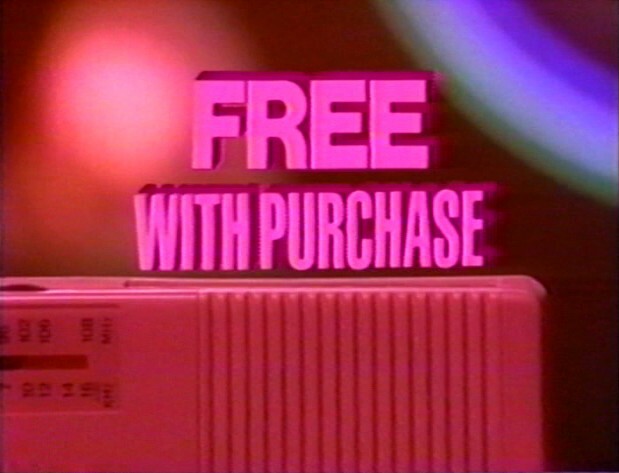 Includes commercial created animation. Featured: Jem/Jerrica, Kimber, Aja, Shana, Rio, Rockin' Roadster, Onstage fashion Award Night, Onstage fashion Permanent Wave, Onstage fashion Encore, Onstage fashion Dancin' The Night Away, Onstage fashion Twilight In Paris, Onstage fashion Music Is Magic, Smashin Fashion (Rio) On the Road with Jem, FlipSide fashion Gettin' Down to Business. Britta Phillips and background singers: Oh Jem, Jem and the Holograms, beautiful hair that's truly outrageous! Style it any way you like it. Style it for fashion, style it for fun, style it for glamour, and life on the run. Girl 1: That's so cool! I love what you did with her hair! 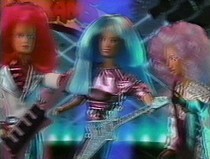 Jem and the Holograms' hair is so outrageous. Girl 2: I love the way it looks with her outfit. 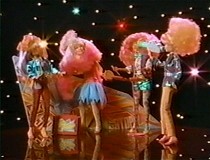 Britta Phillips and background singers: Beautiful hair that's truly outrageous! Female voice: Jem and her friends and fashions sold separately. Finally the Holograms are mentioned by name. Here Jem has a solid pink microphone. 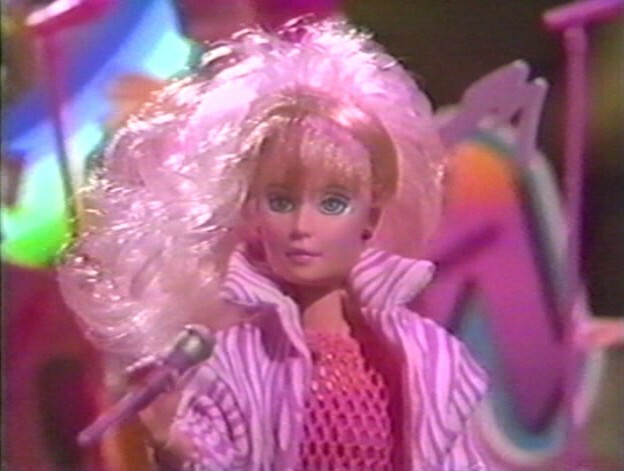 Female voice: She's Jem, the most glamorous rockstar ever. 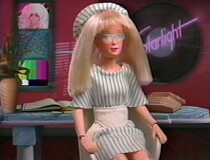 She's also Jerrica, the president of Starlight Music. But only her friends the Holograms, Kimber, Aja and Shana know that Jerrica is also Jem. Girl 1: Their clothes are so sharp. Girl 2: Her Jem star earrings are the ultimate. Their music is totally awesome. 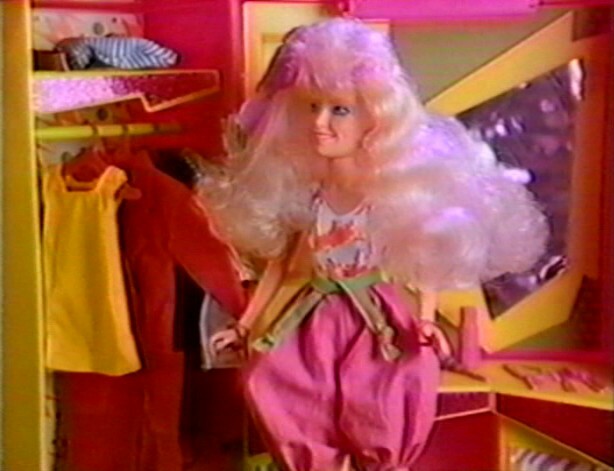 Female voice: Jem comes with Jem and Jerrica outfit. 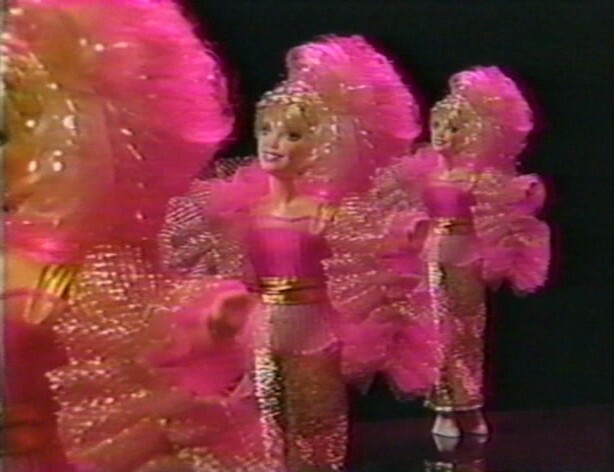 Kimber, Aja and Shana, sold separately with cassette, from Hasbro. 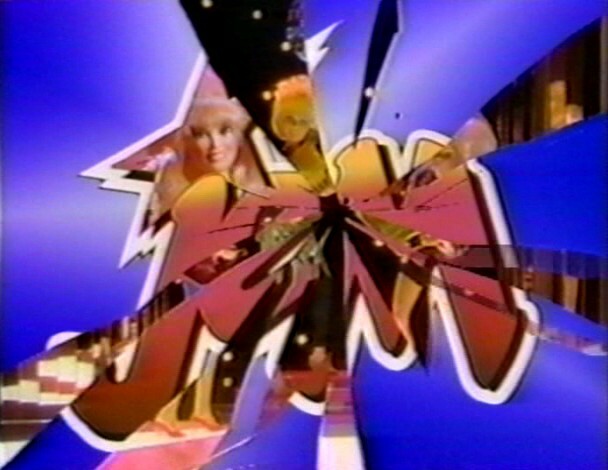 The Holograms are mentioned by name, while the Misfits are only mentioned by their group name. Strangely Rio was not featured in this commercial, maybe he wasn't made yet. 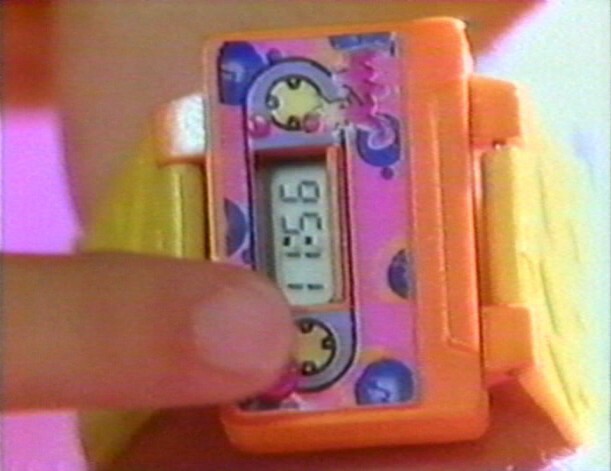 Includes commercial created animation. Featured: Jem/Jerrica, Kimber, Aja, Shana, Pizzazz, Roxy, Stormer, and Rockin' Roadster. Misfits part of the Jem Theme playing. 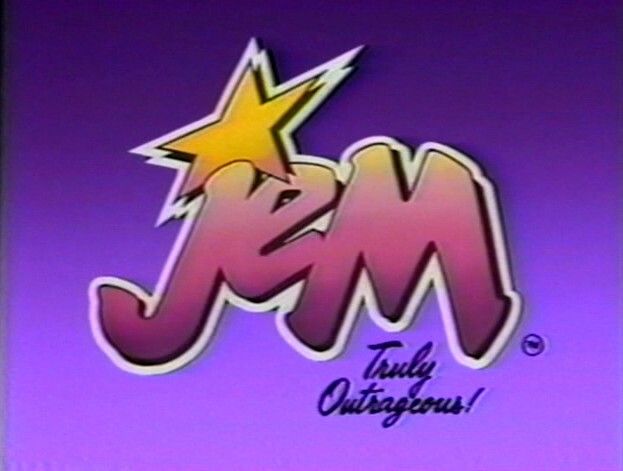 Female voice: Jem, truly Outrageous. And they're each sold separately, from Hasbro. 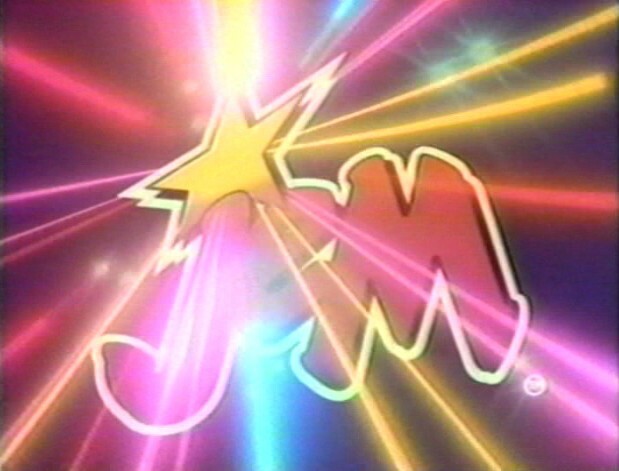 Jem Theme ending saying "Jem". Now the Misfits are mentioned by their first names, the Holograms aren't. 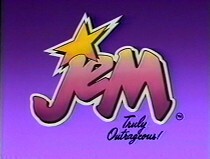 Includes commercial exclusive animation with Jem and the Holograms, the roadster and the Misfits, storyboarded by Will Meugniot. 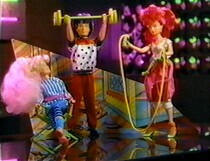 The cartoon Misfits resemble their early look from the first five episodes (although there's a blooper since Roxy has green pants instead of one leg dark pink). 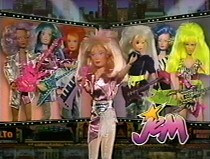 Featured: Jem/Jerrica, Kimber, Aja, Shana, Pizzazz, Roxy, Stormer, and Rockin' Roadster (only in the animated bits). Background singers: Jem is truly outrageous! Ellen Bernfeld: But we're the Misfits, we're gonna get her! Female voice: Meet the Misfits, Roxy, Stormer and Pizzazz! Ellen Bernfeld: We are the Misfits, the Misfits, our songs are better! Girl 1: The Misfits are so daring, their music is awesome! I just love their clothes, they're wild. Girl 2: Look, it's Jem and the Holograms! Girl 1: The Misfits are better! Girl 2: We'll let the fans decide. Female voice: Jem and her friends sold separately. 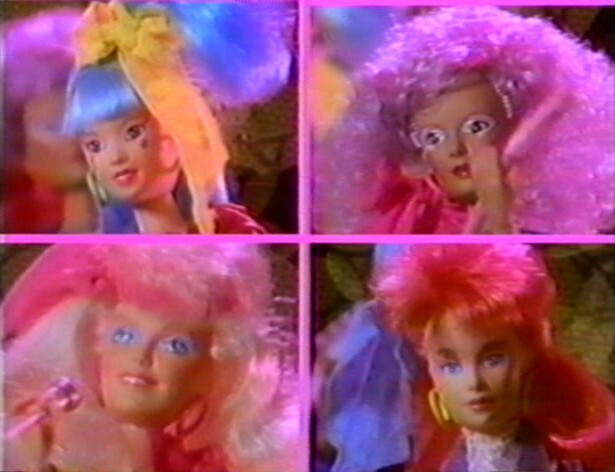 The Misfits, Pizzazz, Roxy and Stormer each sold separately with cassettes, from Hasbro. 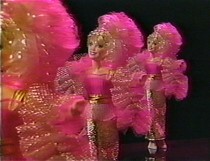 The Holograms are mentioned by their names. 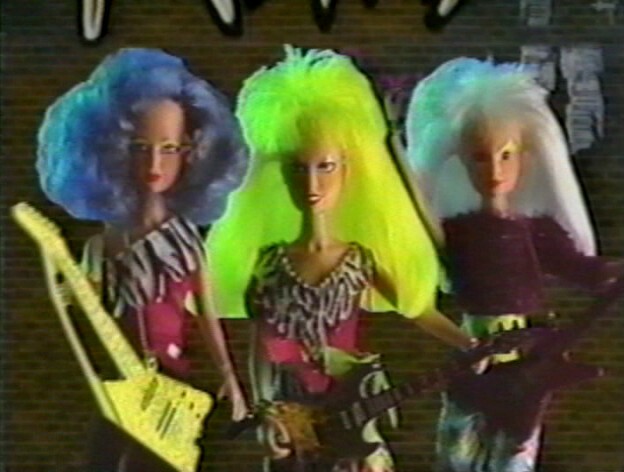 This is the Jem commercial that mentions that the Jem dolls are taller than Barbie. Featured: Jem/Jerrica, Kimber, Aja, Shana, Star Stage, Onstage fashion Award Night, Onstage fashion Permanent Wave, Onstage fashion Encore, Onstage fashion Dancin' The Night Away, Onstage fashion Twilight In Paris, Onstage fashion Music Is Magic, Onstage fashion Command Performance, Onstage fashion Only the Beginning, FlipSide fashion Gettin' Down to Business, FlipSide fashion Sophisticated Lady, FlipSide fashion City Lights, FlipSide fashion Like A Dream, FlipSide fashion Let's Rock This Town, FlipSide fashion Music in the Air. 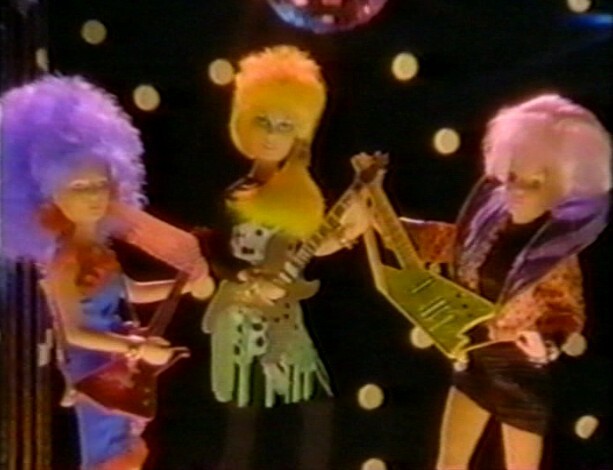 Britta Phillips and background singers: Whoa Jem! Jem and the Holograms, they've got beautiful clothes that are truly outrageous. Girl 1: I like the way they look in their outfits. Girl 1: And they're all taller than Barbie. Girl 2: Lets change clothes for the concert. Girl 1: Wait 'til you see this let on. Jem that's so cool. Girl 2: Look at Shana, the ultimate. Girl 1: Aja looks so fresh. 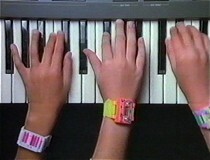 Now lets play our music. Background singers: Music is magic. 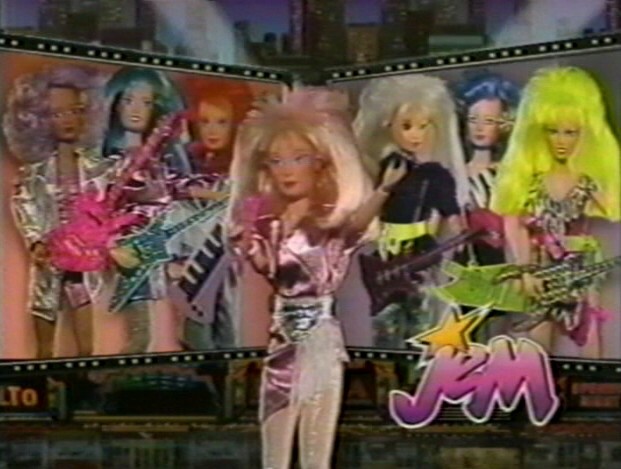 Female voice: Jem and her friends and fashions, sold separately. The Holograms are called "Jem's friends". Featured: Jem/Jerrica, Kimber, Aja, Shana, Onstage fashion Permanent Wave, Onstage fashion Encore, Onstage fashion Music Is Magic, Onstage fashion Dancin' The Night Away, and the Star Stage. 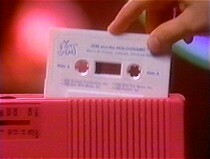 Britta Phillips: Jem's got a cassette player. Britta Phillips: Jem's got a cassette player that turns into the Jem Star Stage. 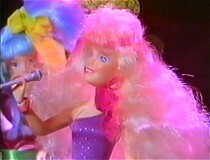 Jem puts on the ultimate concert, right on the Jem Star Stage. It can turn into Starlight Music, where Jerrica spends her days. Yes, yes, yes it's the best. Jem on the Jem Star Stage. Female voice: The Jem Star Stage converts into a portable cassette players. Jem and her friends sold separately. 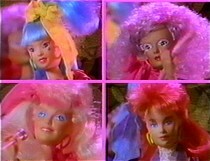 Featured: Jem/Jerrica, Kimber, Aja, Shana, and the Star Stage. 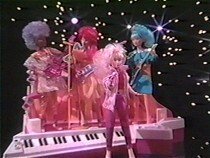 Background singers: Rocking out on the Jem Star Stage, it's the hottest concert. Jem... the Jem Star Stage... truly truly truly outrageous! 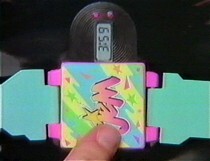 Female voice: The Jem Star Stage convert into a portable cassette player. Jem and her friends sold separately, from Hasbro. 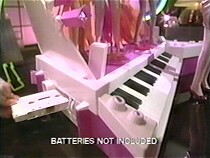 Male voice: Batteries not included. The playset seen here is the prototype one, which differs from the final version, as you can see on the mirror shape inside and the big round speaker on the outside. Jerrica is not shown, just her outfit. Featured: Jem, Kimber, Aja, Shana, Onstage fashion Twilight In Paris, Onstage fashion Dancin' The Night Away, FlipSide fashion Let's Rock This Town, FlipSide fashion Like A Dream, and the Rock Backstager. 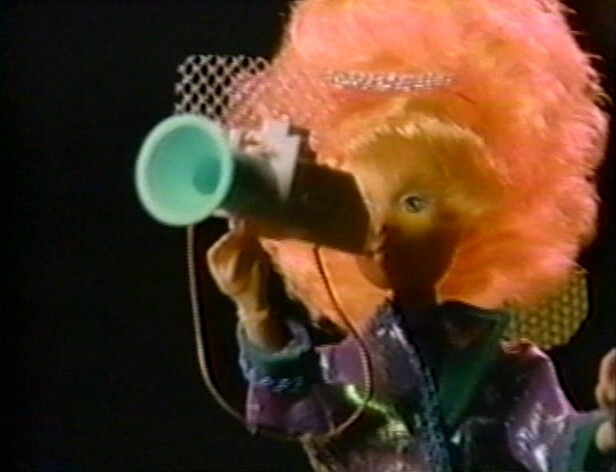 Background singers: Jem! Before a night on the town, or after a show, the Rock Backstager is where Jem goes. The Rock Backstager, Jem is truly truly outrageous. 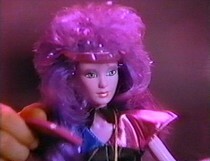 Female voice: Jem's Rock Backstager, outside it's a rock 'n roll speaker, inside Jem keeps her wardrobe and accessories. 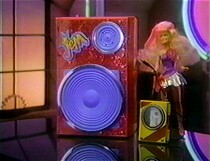 And it's a real speaker you plug your own music into, while Jem is ready for a night out with the Holograms. Girl 1: Now to the city. Female voice: Jem's Rock Backstager, Jem's wardrobe and Jem and her friends sold separately, from Hasbro. This is the prototype roadster with the silver hubcaps. 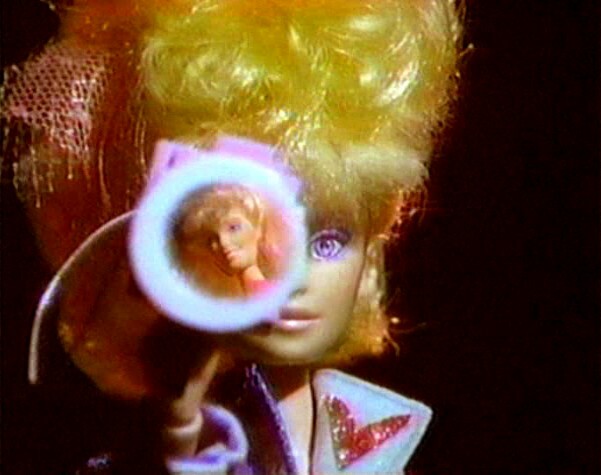 Kimber is shown animated only, not the doll.The animated bit shows the Eiffel tower for some reason. Featured: Jem, Rio, Shana (guitar only), Onstage fashion Award Night, Onstage Fashion Permanent Wave, FlipSide fashion Gettin' Down To Business, Smashin' fashion (Rio) Truly Outrageous, Rockin' Roadster. Jem's got a Rockin' Roadster, and yes yes yes it's the best. It's got an FM radio, FM radio for FM sound. Jem's got a Rockin' Roadster and it's the coolest car in town. Jem's got a Rockin' Roadster. Girl 1: Hey Rio, wanna ride to the concert? Female voice: Rockin' Roadster comes with FM radio. 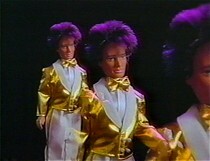 Jem, Rio and fashions sold separately. This is again the prototype roadster with the silver hubcaps. Kimber is shown animated only, not the doll. The animated bit shows the Eiffel tower for some reason. Featured: Jem, Rio, Shana (guitar only), Rockin' Roadster, Onstage fashion Award Night, Onstage Fashion Permanent Wave, FlipSide fashion Gettin' Down To Business, Smashin' fashion (Rio) On The Road With Jem. Background singers: Jem! Jem's got a Rockin' Roadster, does she need a limo? 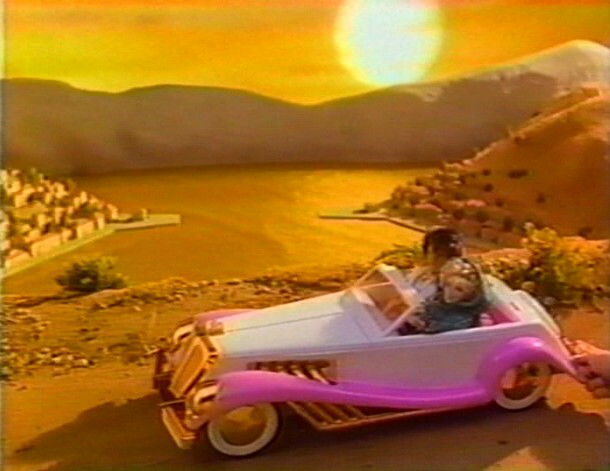 Jem's got a Rockin' Roadster to take her, where she wants to go. Jem is truly truly outrageous! 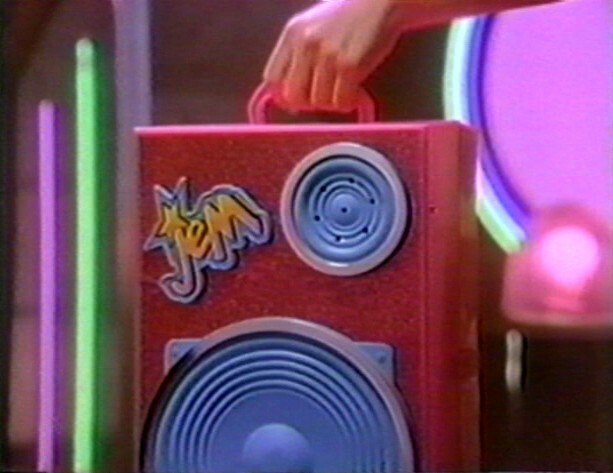 Female voice: Hidden in the trunk is an FM radio, and under the hood there's room for Jem's costumes and musical instruments. 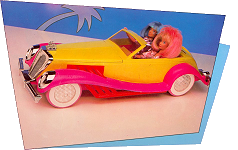 Jem's Rockin' Roadster comes with an FM radio. Jem and Rio sold separately, from Hasbro. 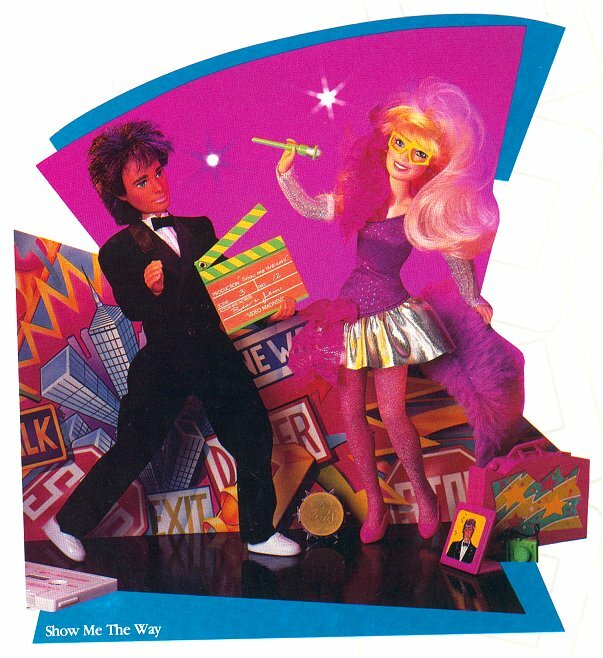 What's cool with this comemrcial is that you can see lots of boxed Jem dolls and fashions, not up close though. Featured: Jem, Kimber, Aja, Shana, Star Stage, Cassette. 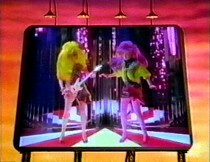 Background singers: Jem's making music..
Britta Phillips: Whoooa. That's truly truly truly outrageous. 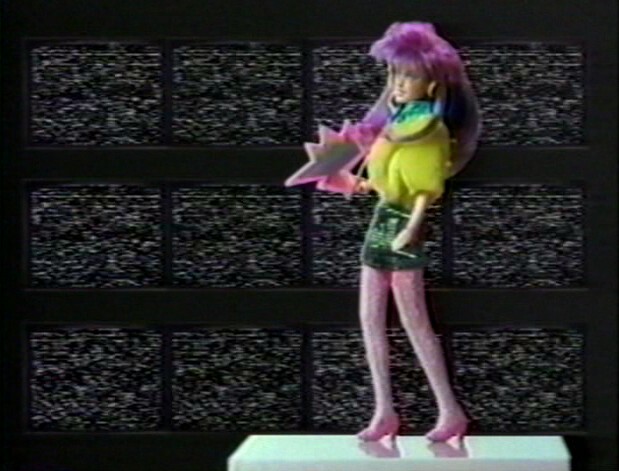 Female voice: Now, get a free cassette with new Jem songs, when you buy any of the Jem dolls. Part of song "Jealousy" playing. Part of song "Universal Appeal" playing. Part of song "Who Is He Kissing" playing. Female voice: The music cassette is free at the participating stores when you buy any of the Jem dolls, and you get a free Jem poster too. Girl 1: I've got mine! Girl 2: I've got mine! Girl 3: I've got mine! Mix of several commercials to show it all at once, perhaps the fashion part is new. We don't really get to see Jerrica. The Holograms and Misfits are only mentioned by group name, and Rio isn't mentioned at all. Featured: Jem, Kimber, Aja, Shana, Pizzazz, Roxy, Stormer, Flipside fashion Sophisticated Lady, Flipside fashion Music In The Air, Flipside fashion City Lights, Smashin' fashion (Rio) Truly Outrageous, Onstage fashion Award Night, Rockin' Roadster, Rock Backstager, and the Star Stage. Part of Jem Theme song playing. Female voice: It's the truly outrageous world of Jem, starring Jem with her flashing electronic earrings, and fashions, fashions and more fashions. 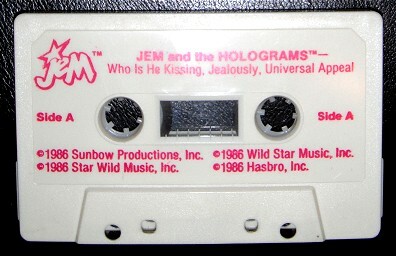 Female voice: Jem's friends the Holograms, and her rivals the Misfits, each come with a music cassette. Girl 1: The music is awesome. 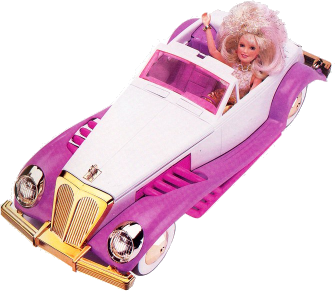 Female voice: And Jem's got a Rockin' Roadster with an FM radio. 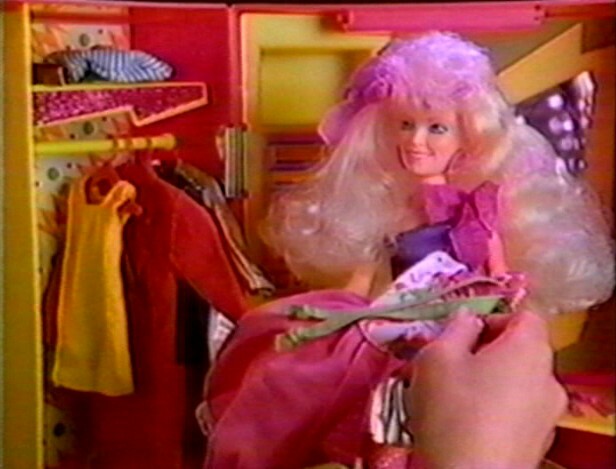 Female voice 2: The Rock Backstager is where I keep Jem's wardrobe and accessories. 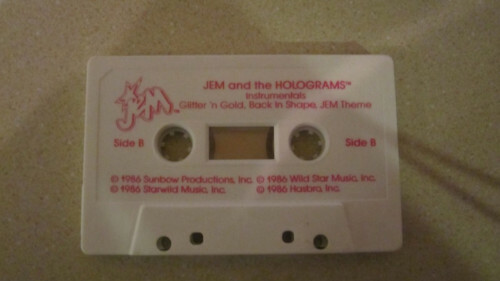 Female voice: And the Jem Star Stage converts to a portable cassette player. And there's more and it's all coming this year. Same as above commercial but in French of course. This is one well done commercial, good job Hasbro! The entire Glitter 'n Gold line was shown except for the fashion Purple Haze, maybe it was made later than the rest? Featured: Glitter 'n Gold Jem/Jerrica, Glitter 'n Gold Rio, Glitter 'n Gold fashion Fire & Ice, Glitter 'n Gold fashion Gold Rush, Glitter 'n Gold fashion Midnight Magic, Glitter 'n Gold fashion Moroccan Magic, Glitter 'n Gold fashion Golden Days Diamond Nights, Glitter 'n Gold Roadster. Female voice: Glitter and gold Jem, Rio, fashions and accessories sold separately. 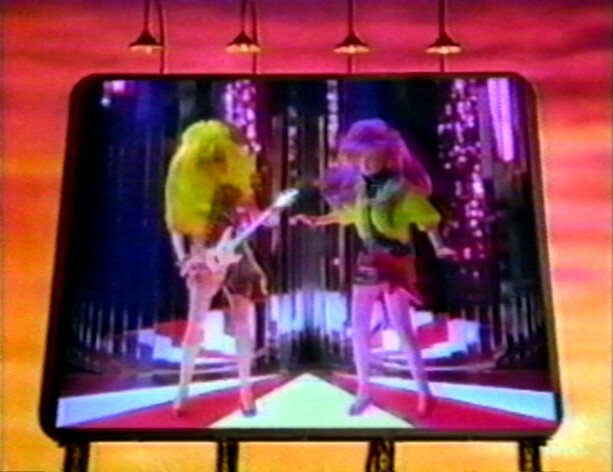 The second Jem theme is used in this commercial, with different lyrics and sung by someone else. Jerrica is cut out here, and so is Glitter 'n Gold fashion Moroccan Magic. Featured: Glitter 'n Gold Jem, Glitter 'n Gold Rio, Glitter 'n Gold fashion Fire & Ice, Glitter 'n Gold fashion Gold Rush, Glitter 'n Gold fashion Midnight Magic, Glitter 'n Gold fashion Golden Days Diamond Nights, Glitter 'n Gold Roadster. Background singers: Me and my friends are Jem girls, and now we're going gold. ... Glitter and gold, just so exciting and beautifully bold. 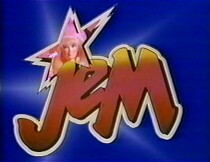 Come on come one and be a Jem girl, Jem! Same as the above US commercial. 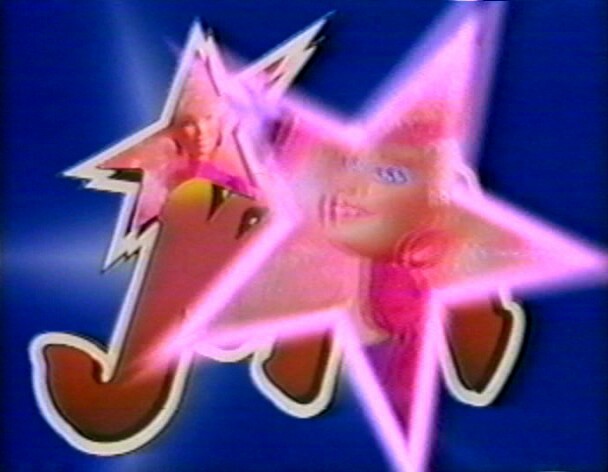 The second Jem theme is used in this commercial, in French. Featured: Rock 'n Curl Jem, Kimber 2nd edition, Aja 2nd edition, Shana 2nd edition, Onstage fashion Come On In, Onstage fashion How You Play the Game, Onstage fashion Love's Not Easy, Onstage fashion There's A Melody Playin'. 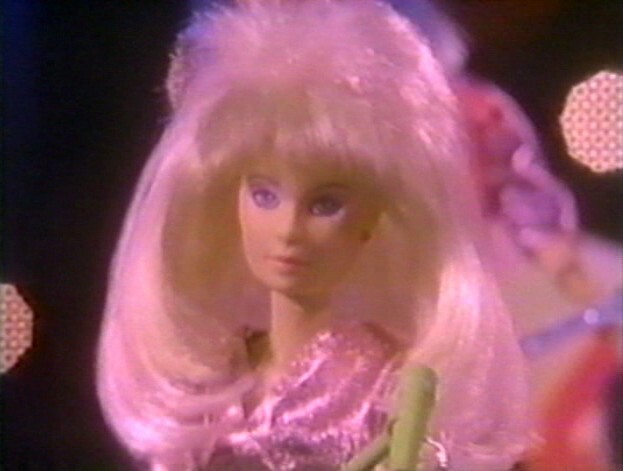 Britta Phillips: Look new Jem, new Rock 'n Curl Jem, you'll see the greatest look, the most incredible hair, when Rock 'n Curl Jem is there. Whoooaawhoooa what a smile she's the prettiest girl. I love new Jem Rock 'n Curl. Girl 1: She's prettier than ever. Girl 2: I love what you can do with her hair. Britta Phillips: You can curl it up, you can tease it out, Rock 'n Curl Jem's got hair to rave about. Jem Rock 'n Curl, Rock 'n Curl Jem. 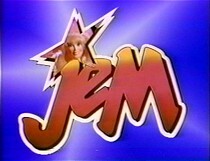 The second Jem Theme song is sung with other lyrics. Featured: Rock 'n Curl Jem, Onstage fashion Come On In, Onstage fashion How You Play the Game, Onstage fashion Love's Not Easy, Onstage fashion There's A Melody Playin'. 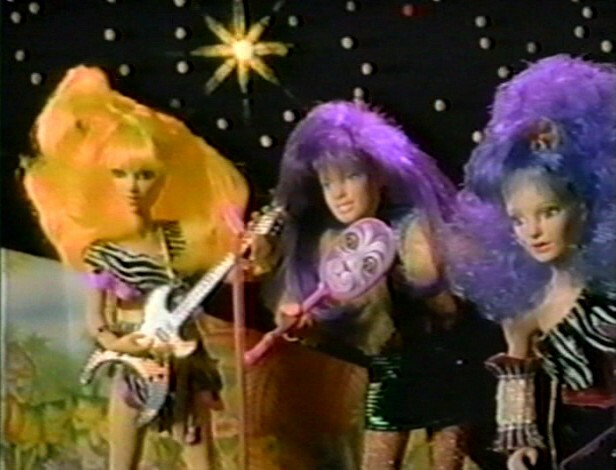 Background singers: Me and my friends are Jem girls, and now there's Rock 'n Curl. You'll see the greatest look and most incredible hair, when Rock 'n Curl Jem is there. 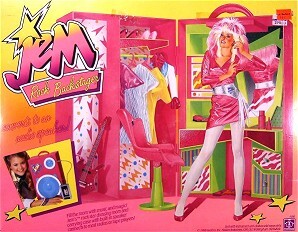 Come on come on and be a Jem girl. Jem! This was the French name for Rock 'n Curl Jem. We get to hear the second Jem cartoon theme in French. Featured: Rock 'n Curl Jem doll, Onstage fashion Come On In, Onstage fashion How You Play the Game, Onstage fashion Love's Not Easy, Onstage fashion There's A Melody Playin'. Featured: Rock 'n Curl Jem, Kimber 2nd edition, Aja 2nd edition, Shana 2nd edition, Video. 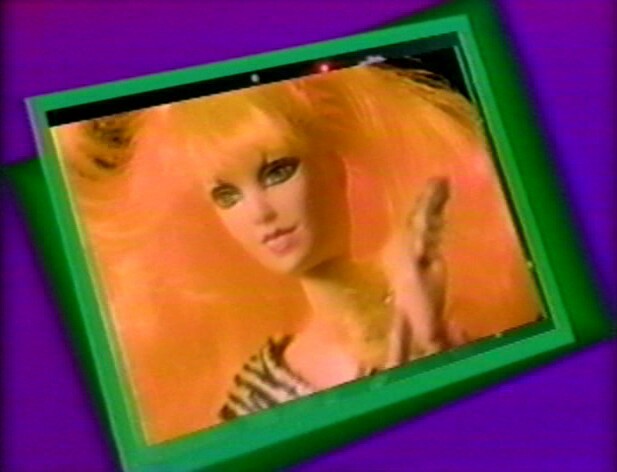 Britta Phillips: Jem's making a music video, with Video. 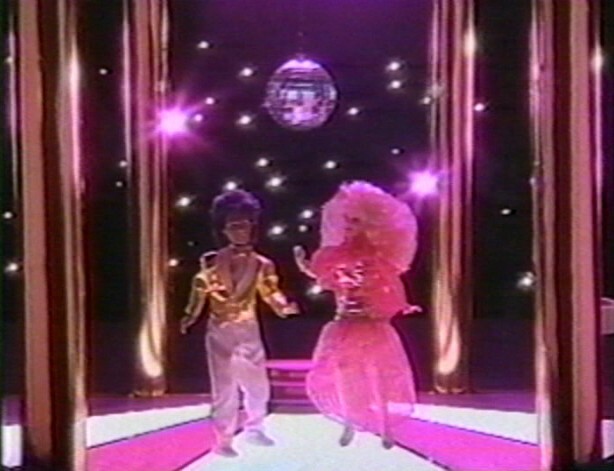 Female voice: Jem shows are all taped by the new Hologram, Video! Britta Phillips: Now take a new look at the Holograms! Girl 1: They've all got cool new outfits, and fresh new music. 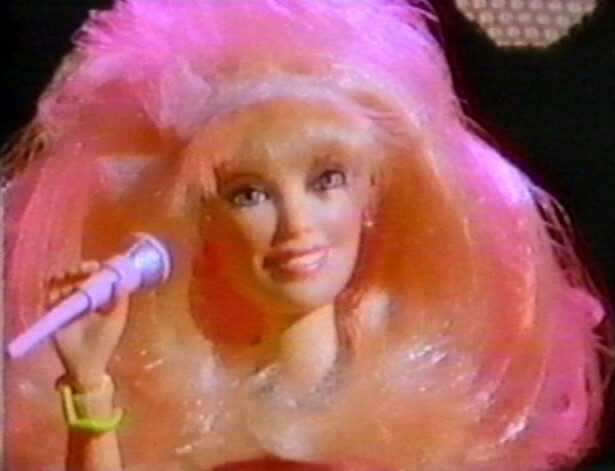 Female voice: And here's Rock 'n Curl Jem. Britta Phillips: Curl it up or tease it out, Rock 'n Curl Jem's got hair to rave about. 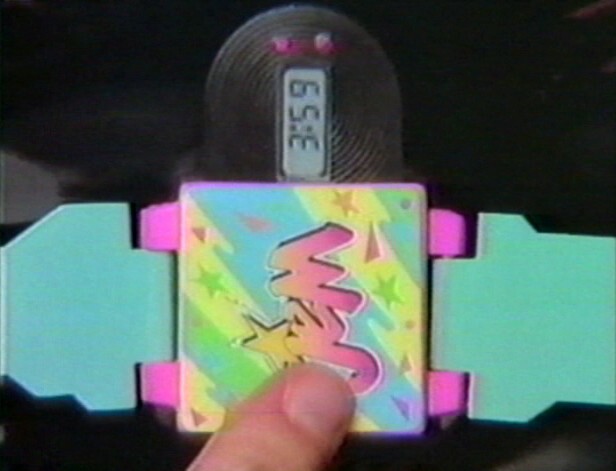 Female voice: The Holograms and Video sold separately, with cassette. Rock 'n Curl Jem sold separately too. Featured: Flash 'n Sizzle Jem/Jerrica, Kimber 2nd edition, Aja 2nd edition, Shana 2nd edition, Danse. 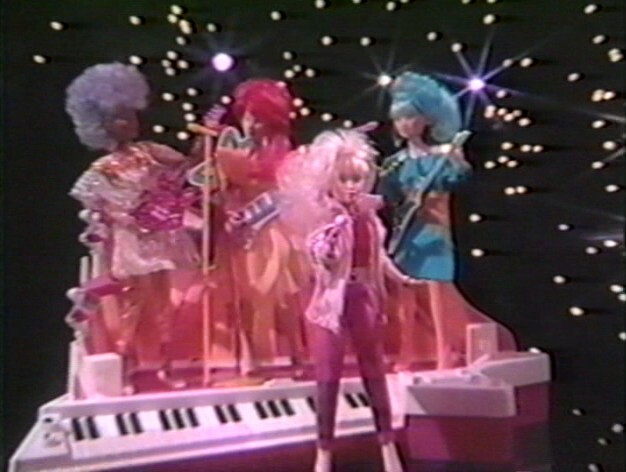 Britta Phillips and background singers: Jem, Jem's friend Danse, Danse, is truly outrageous! 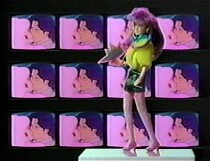 Female voice 1: Danse stages all of Jem's dance routines. Girl 1: She's the ultimate. Britta Phillips and background singers: Now take a new look at the Holograms! 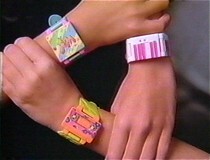 Girl 1: They've all got cool new outfits and fresh new music. Britta Phillips and background singers: And new Flash 'n Sizzle. Girl 2: She's prettier than ever! 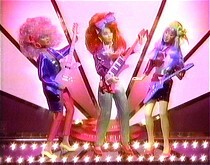 Britta Phillips and background singers: Flash 'n Sizzle Jem! Female voice 1: Flashing earrings and fantastic new fashions for Jem and Jerrica. 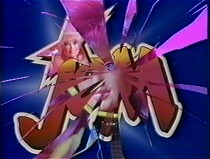 Britta Phillips: Flash 'n Sizzle Jem. Female voice 2: Accessories sold separately. Female voice 1: Flash 'n Sizzle Jem, Danse and the Holograms, sold separately with cassette. Featured: Flash 'n Sizzle Jem/Jerrica, Kimber 2nd edition, Aja 2nd edition, Shana 2nd edition, Raya. 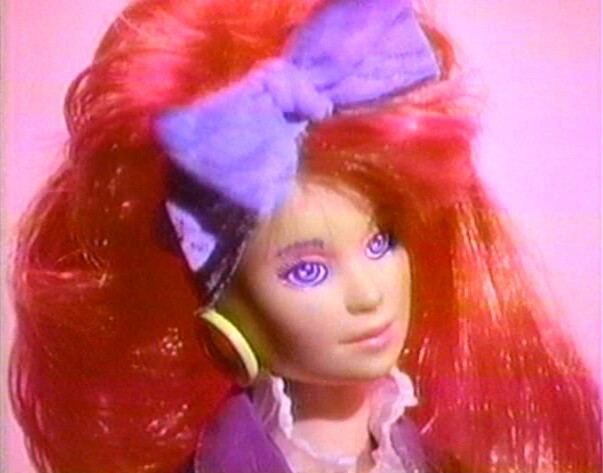 Britta Phillips: Jem's friend, Raya. Raya, Raya she's drumming... ...for Jem. Girl 1: She looks so fresh. Female voice: And Raya's joined the Holograms. 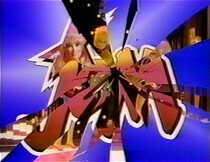 Britta Phillips: And here's Flash 'n Sizzle. Girl 2: She's prettier than ever. 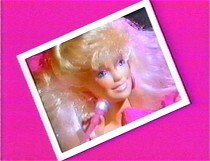 Female voice: Flashing earrings and fantastic new fashions for Jem and Jerrica. Female voice: Flash 'n Sizzle Jem, Raya and the Holograms sold separately with cassette. 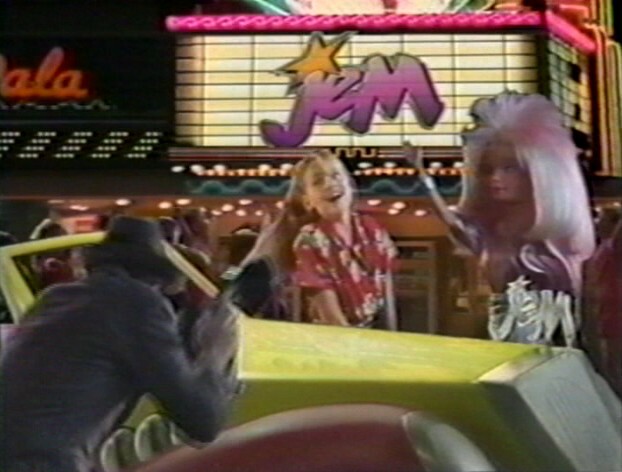 This is a second year commercial as you can see by the appearance of Flash 'n Sizzle Jem and the Misfits second year Smashin' fashions. But the Misfits' instruments are still the first year ones. 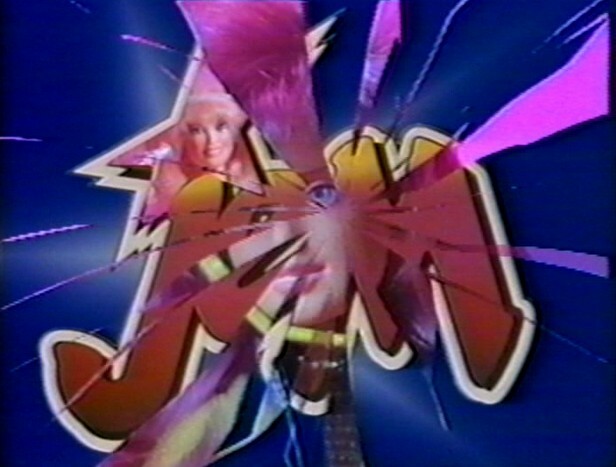 Featured: Flash 'n Sizzle Jem, Kimber 2nd edition, Aja 2nd edition, Shana 2nd edition, Smashin' fashion Designing Woman, Smashin' fashion Gimme. Gimme. Gimme, Smashin' fashion We're Off and Running. Ellen Bernfeld: Is battling the Misfits. Battling the Misfits, in the battle of the bands. Ellen Bernfeld: Roxy, Stormer and Pizzazz. Girl 1: Their clothes are outrageous! Ellen Bernfeld: We are the Misfits, our music is better! Girl 2: Their music's awesome! Ellen Bernfeld and background singers: We're takin' it takin' it takin' it all! 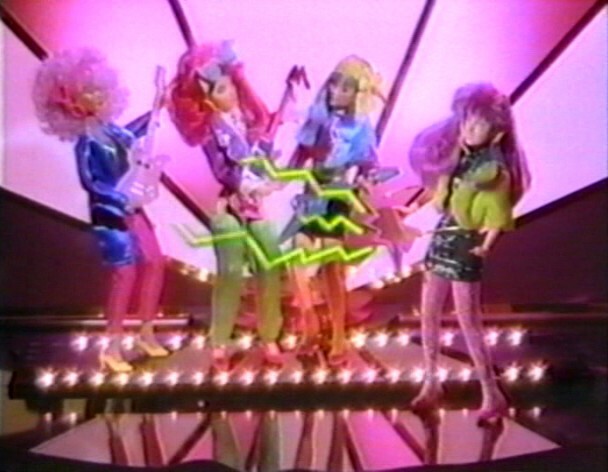 Girl 2: It's Jem and the Holograms! Girl 2: We'll let our fans decide. 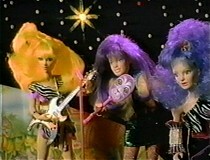 Female voice: Flash 'n Sizzle Jem, the Holograms and the Misfits, each sold separately, with cassette. 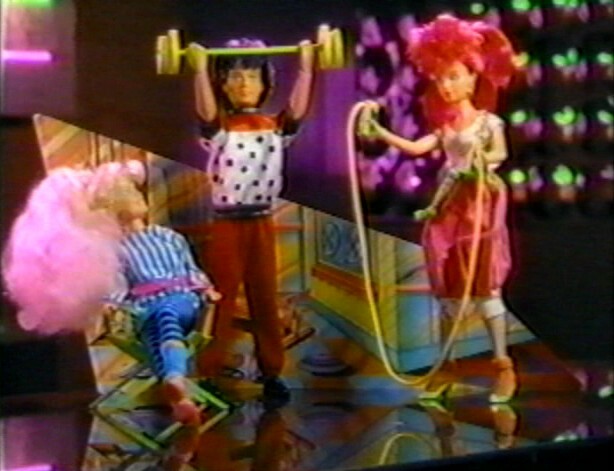 Pizzazz is the only one of the Misfits shown in this commercial. Featured: Flash 'n Sizzle Jem/Jerrica, Kimber 2nd edition, Aja 2nd edition, Shana 2nd edition, Pizzazz, Synergy, Clash. Female voice: Ask Jem about Clash. 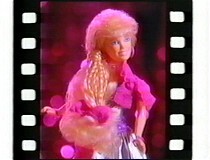 Ellen Bernfeld: Her name is Clash and her fashions are smashin', she's a new Misfit and she's trouble for Jem. Girl 1: Clash can jam Jem's concerts. Girl 2: But Jem's got Synergy. Showtime Synergy! 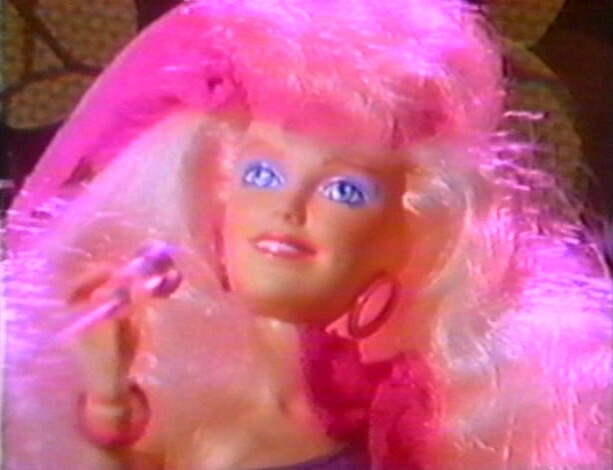 Female voice: Synergy can project holograms and turn Jerrica into Jem. Girl 2: Synergy's Jem secret protector. She's the ultimate. Girl 3: I love Synergy's music. Girl 1: I love Clash's. Girl 2: They're both outrageous. 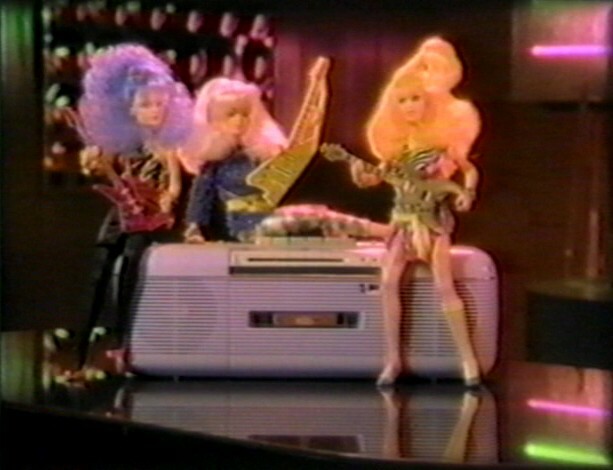 Female voice: Synergy, Jem, Pizzazz and Clash, sold separately. Since Hasbro was re-releasing this playset for the second year, they did another commercial for it. It's no longer the prototype used in this commercial, except for the old footage from the first year commercial when the Rock Backstager opens up by itself infront of a city background. Featured: Rock 'n Curl Jem, Kimber 2nd edition, Aja 2nd edition, Shana 2nd edition, Flipside fashion City Lights, Onstage fashion Come On In, Onstage fashion How You Play the Game, Onstage fashion Love's Not Easy, Onstage fashion There's A Melody Playin', Onstage fashion Friend or Stranger, Rock Backstager. Britta Phillips: Plug in your music, play the best. 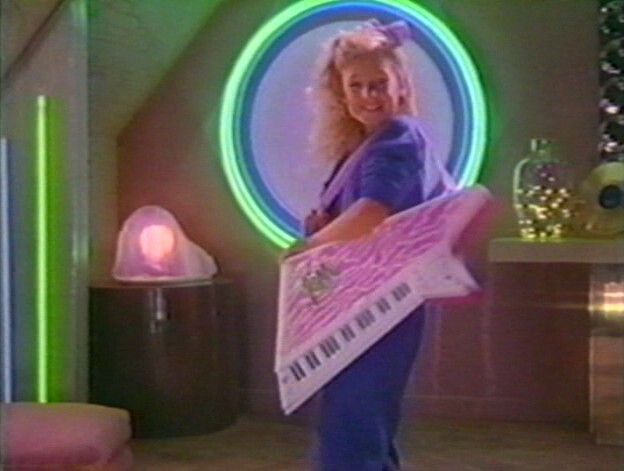 Britta Phillips: Pick out Jem's outfit, totally fresh. 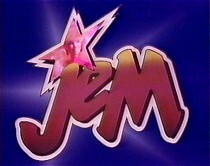 Jem's got a Rock Backstager. 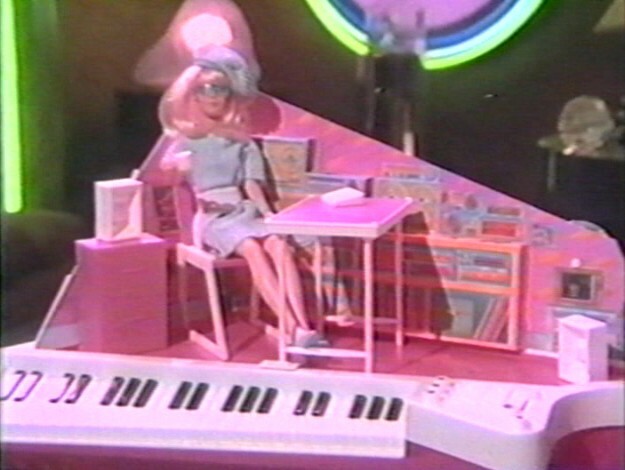 Female voice: Jem's Rock Backstager, Jem's wardrobe and Jem and her friends sold separately. 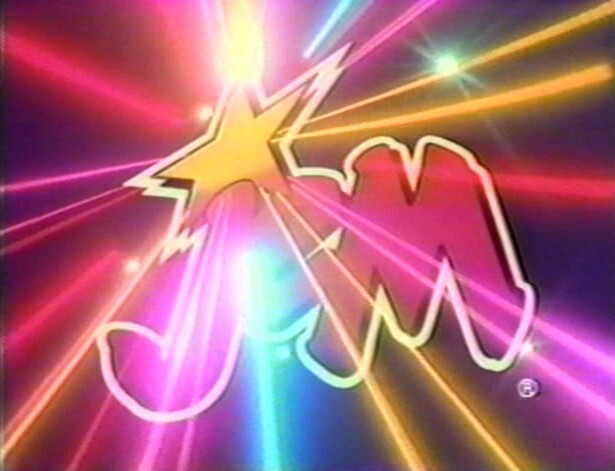 Was to feature exclusive animation storyboarded by Will Meugniot, who did all the other storyboarding for animated Jem toy commercials. Featured: Rock 'n Curl Jem, Flash 'n Sizzle Jem, Pizzazz, Roxy, Stormer, Video, Danse, Raya, Clash, Rio fashion Congratulations, Rio fashion Universal Appeal, Onstage fashion Friend or Stranger, Onstage fashion Come On In, Video Madness It's Workin' Out, Video Madness Love Is Here, Video Madness Show Me The Way, Video Madness Welcome To The Jungle. 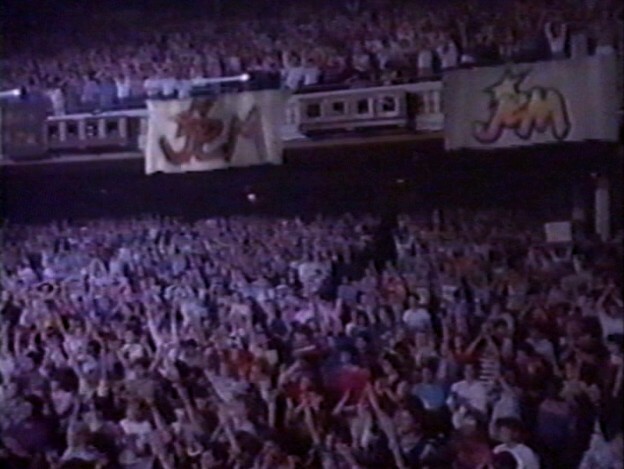 Britta Phillips: Whoooa Jem's got Video Madness. Part of song "Love Is Here" playing. Part of song "Show Me The Way" playing. 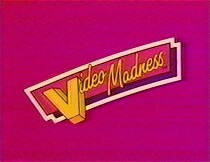 Female voice: Video Madness gives you the backdrop prop, the music to stage rock videos. Part of song "It's Workin' Out/It's Doin' Me In" playing. Girl 2: Welcome to the Jungle, take one. Part of song "Welcome To The Jungle" playing. Female voice: All four sold separately, Jem and her friends and the Misfits sold separately too. Featured: Jem, Kimber, Aja, Shana, Onstage fashion Twilight In Paris, Onstage fashion Dancin' The Night Away, FlipSide fashion Let's Rock This Town, FlipSide fashion Like A Dream, Star Stage, Cassette. 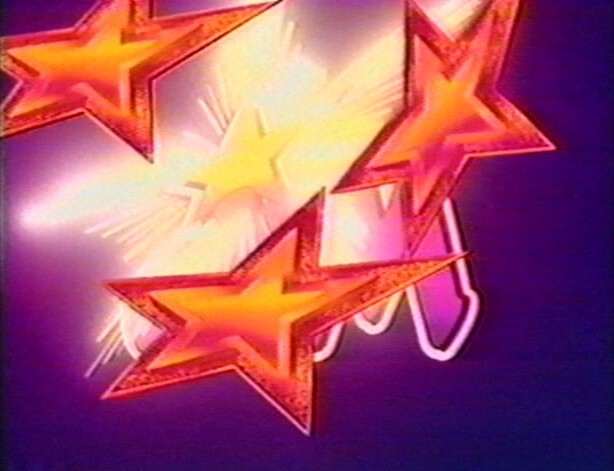 Male voice: ...now you can get a free music cassette featuring Jem's newest hottest single Glitter and Gold plus two more fantastic songs. And that's not all. Got that pencil and paper? 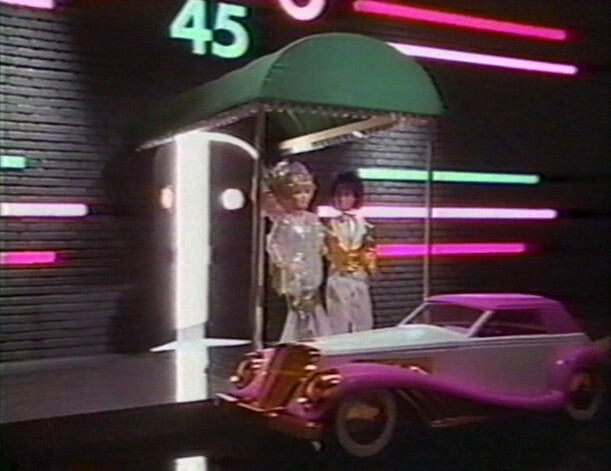 Ok, call 1-900-976-1234 by saturday November 29 (1986!) 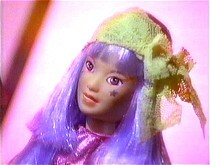 and talk to Jem, and she'll tell you how to get your free cassette plus savings of up to $22 on Jem dolls and playsets. There's a 1$ handling charge. Off expires soon, call now! 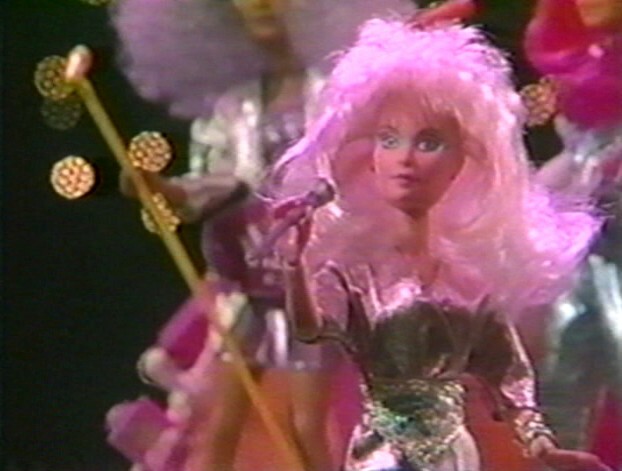 Background singers: Jem, Jem! 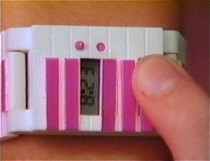 Jem wrist Rocks, rocking with the clock. 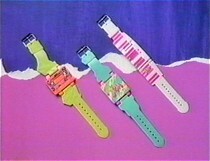 Britta Phillips: Real rock 'n roll watches just for you. Background singers: Jem wrist Rocks, rocking with the clock. 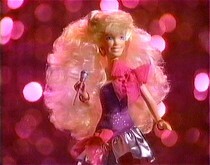 Britta Phillips: Truly outrageous, fresh and new. Girl 1: See the piano, look so fine. Hit the keys and you know the time. 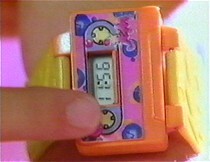 Girl 2: Record album, watch this space, a record flies out and there's the watch face. Britta Phillips: Music cassettes, truly outrageous. 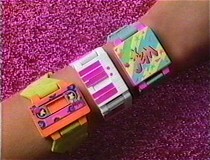 Jem wrist rocks, rocking with the clock.